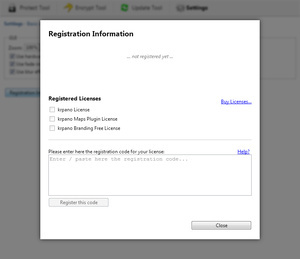 New and easier-to-use license system (no license files anymore). 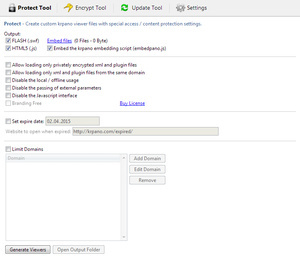 New GUI for the Protect, Encrypt and Update tools. Full Linux versions (GUI + command line tools). Many detail improvements and fixes. The new HTML5 Multiresolution system was build up from ground and designed and optimized for high-performance rendering and the best possible image-quality. It works with WebGL and CSS3D. 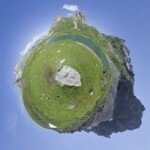 With WebGL projections like Fisheye, Stereographic (=Little-Planet) or Pannini are also available. 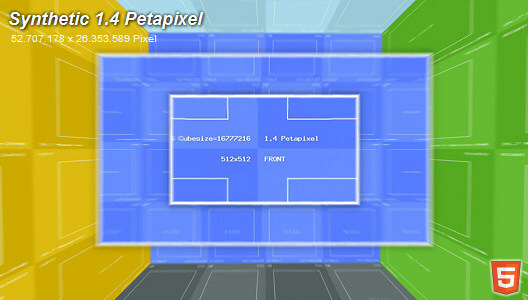 HTML5 Multiresolution is available for Cubical and Flat panos. With version 1.17 the license system has been slightly changed. 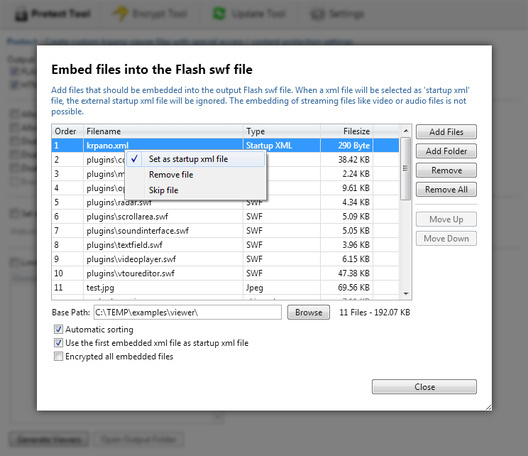 The previously separately available Flash and HTML5 licenses have been merged into one single license. Additionally the license format also has been changed - instead of license files, a simple code which need to be registered only once in the new 'krpano Tools' application will be used. That means there are no license files at all anymore. The license/registration information inside the krpano viewer files will be automatically added when generating new output files (e.g. by using the droplets). Older licenses can be updated or upgraded here. 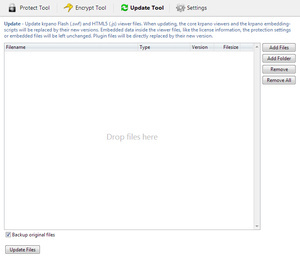 There is new krpano GUI tool named 'krpano Tools'. 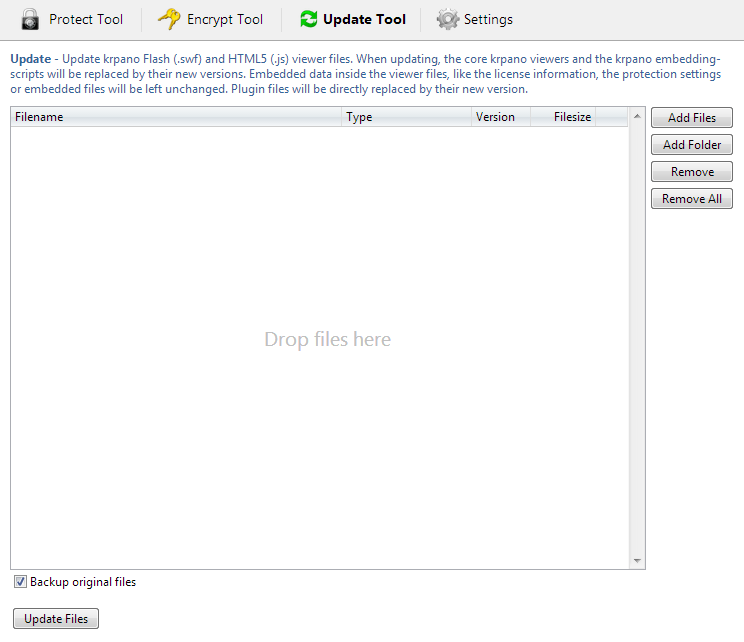 This tool was build with a new HTML/JS-based GUI system (Node-Webkit). This new GUI system provides much more possibilities for new features and allows a much faster development, and it was possible to provide full Linux versions now (identically to the Windows or Mac versions). 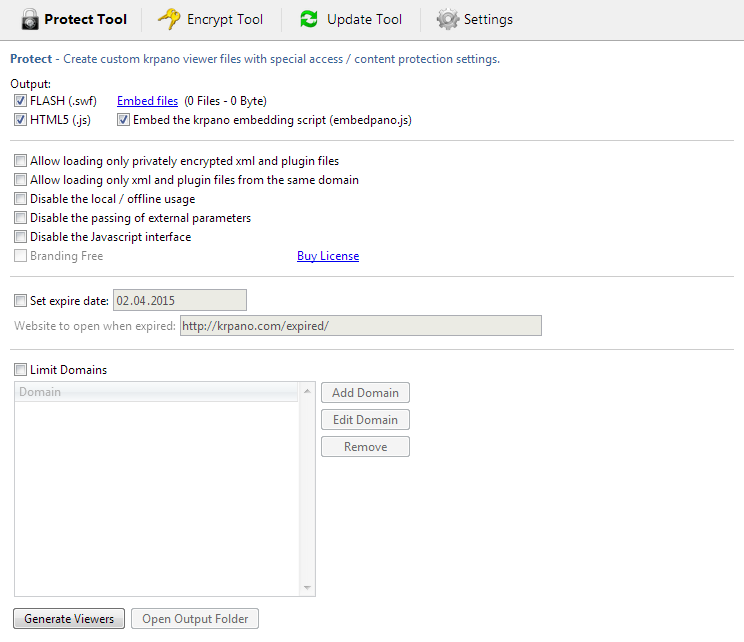 At the moment the tool contains the Protect Tool, the Encrypt Tool, the Update Tool and a window for registering the krpano license. 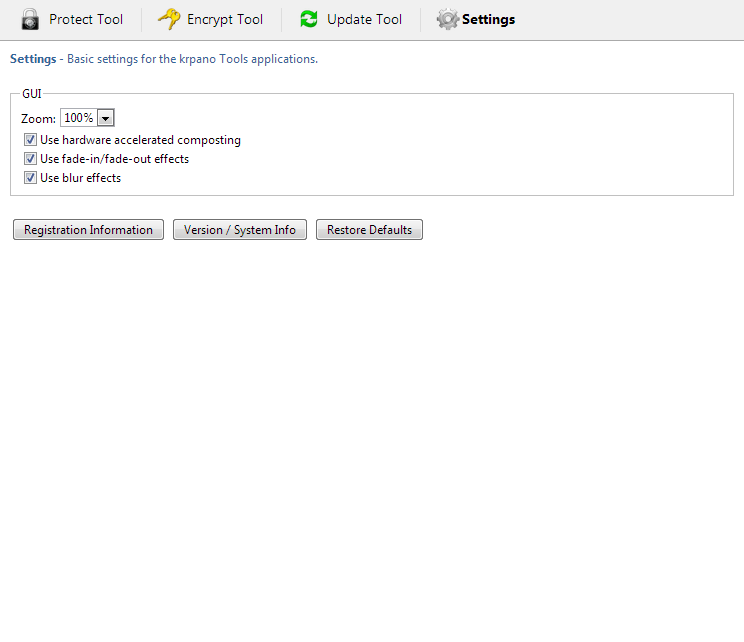 The tools themself were improved in several details - e.g. 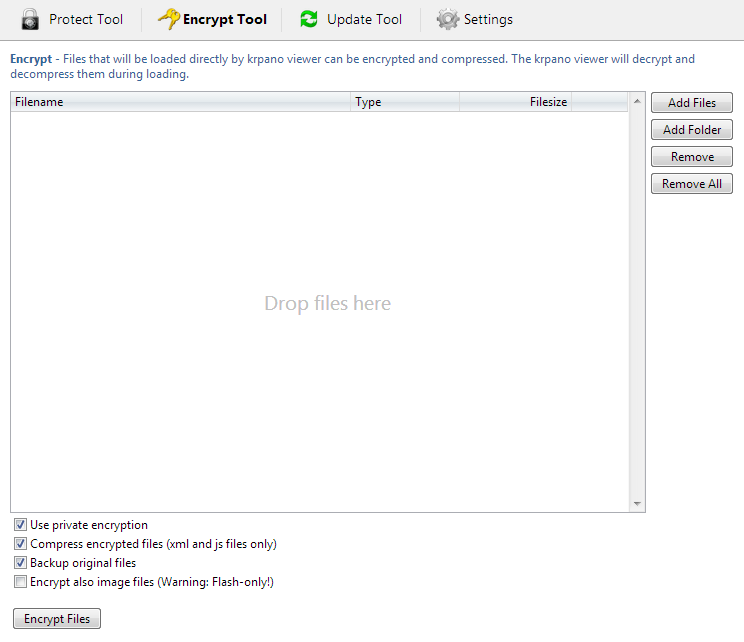 more security features and easier file embedding and updating. 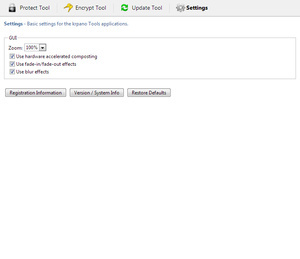 * The full krpanotools filename is 'krpanotools32.exe' or 'krpanotools64.exe' on Windows (depending if 32bit or 64bit). 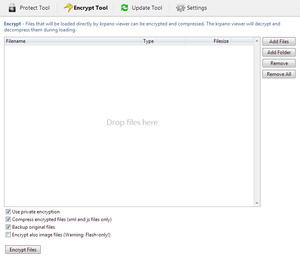 On Mac and Linux the filename is just 'krpanotools'. Improved Textfield plugin - the textfield plugin supports now auto-sizing - when no plugin size will be set or when the autowidth/autoheight setting are enabled, then the plugin will resize itself automatically to set size of the text. Additionally a customizable padding can be set and the text sizes and alignments should be identically in Flash and HTML5. This makes the working with text much easier now. The Scroll-Area plugin has got several additional settings for customizing the movement behavior. The Prealign setting is now supported also in HTML5. The iOS 7.0 'black tiles' problem (happens often in the iOS Chrome browser) is fixed now. All templates and examples are using new iOS 7.1 'minimal-ui' viewport settings for more screenspace and better experience on the iPhone. The defaultskin.xml was updated and refined - the buttons are Retina-compatible now, there is a new autorotate button, the mouse cursor were slightly modified and same projections contextmenu as in the vtourskin.xml is included. 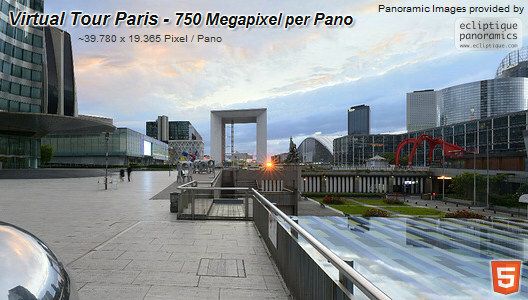 The flat pano skin uses different panning limits for better panning experience by default now. 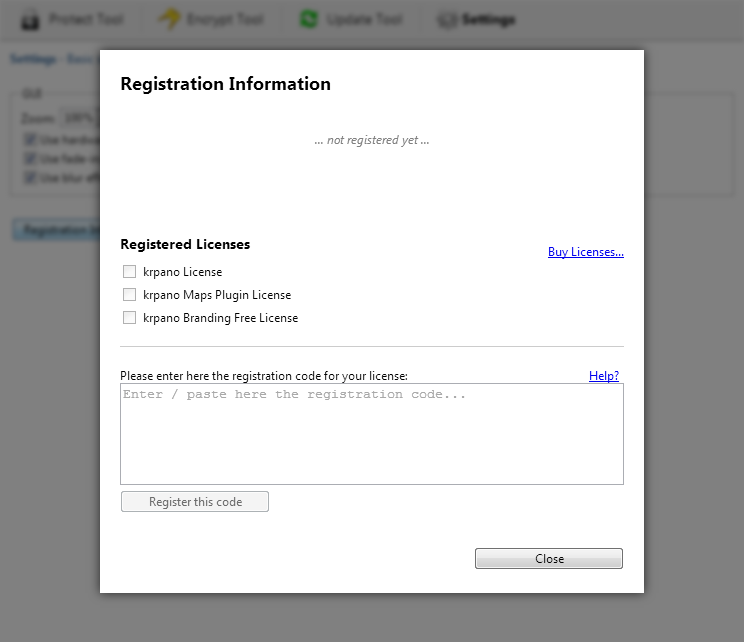 How is managed the krpano bingmaps license ? 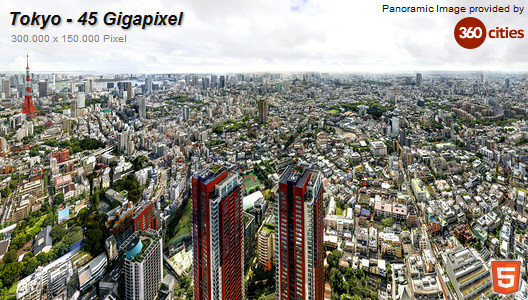 Panoreal — to make and see this wonderful world! Congrats for this final release !! It's just awesome and mindblowing coding for the krpano viewer !! Fix: Wrong overlapping edges in CSS3D rendering in some cases. There is still a lot on my list of things I want to add . Do you have an example link? Just one little note. I also upgrade my licence to the no-branding edition a few days ago and your server sent me an old type licence. No problem for me as I knew about the upgrade page where I could request the right one, but others may not know that. Just one little note. I also upgrade my licence to the no-branding edition a few days ago and your server sent me an old type licence. 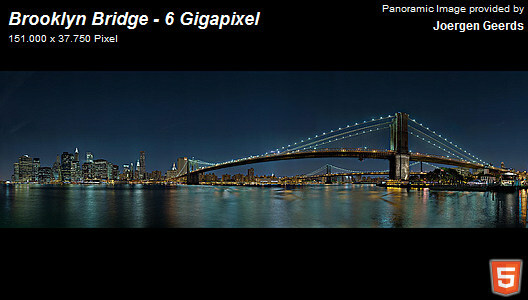 The links on the krpano buy page are only referring to the new licenses (the new and the old licenses have different order numbers). THANK YOU SO MUCH KLAUS!!!! Many features I was waiting for, and those run perfect! Thanks for your work to give us, the pano-developer, a tool... no it`s more a "framework", to create fantastic "pano-worlds" which would be impossible without your work!!! My respect, Klaus!!!! I'm not sure how far the HTML5 WebAudio support is already in the browser today (and how good/reliable it is working) but I will definitely look into that. Without WebAudio support, 3-D sound would be impossible in HTML5. Hi,what the process of getting standalone .exe and .app files with 1.17 krpano tools ? the standalone Flashplayers are currently not included. I'm working on a better way that supports HTML5 too.